A lot of child behavior problems center around meals and food. Addressing these behavior problems requires careful intervention. Kids are bombarded with mixed messages about obesity. Media exposes children to tons of advertisements for unhealthy food. At the same time, the actors discussing the unhealthy food are usually slim and trim. There’s also a huge emphasis on eating healthy. For some children, the discussions about healthy eating can be taken too far. The fear of gaining weight can lead to eating disorders in many people, including young children. Other food-related behavior problems are less serious. They can be addressed with a few changes in discipline strategies and can help children learn how to maintain healthy body weight while still enjoying treats in moderation. A lack of table manners is a common concern among parents. Problems can range from a child not sitting still to a child who is a perpetually slow eater. One of the best ways to prevent and address mealtime behavior problems is to create household rules for the dinner table ahead of time. Establish clear rules about your expectations and discuss the consequences of breaking the rules ahead of time. Follow through with consequences consistently. You can also establish a reward system to motivate children to follow the rules appropriately. It can be frustrating when a child refuses to eat whatever you prepare for dinner. Often, power struggles ensue as frustrated parents try to get kids to eat a balanced diet. If you’re not careful, however, you might a fussy eater's habits worse. It’s important to avoid power struggles if your child refuses to eat certain foods. Otherwise, you may accidentally reinforce a child’s picky eating habits. Also, make sure to rule out any underlying reasons for picky eating habits. 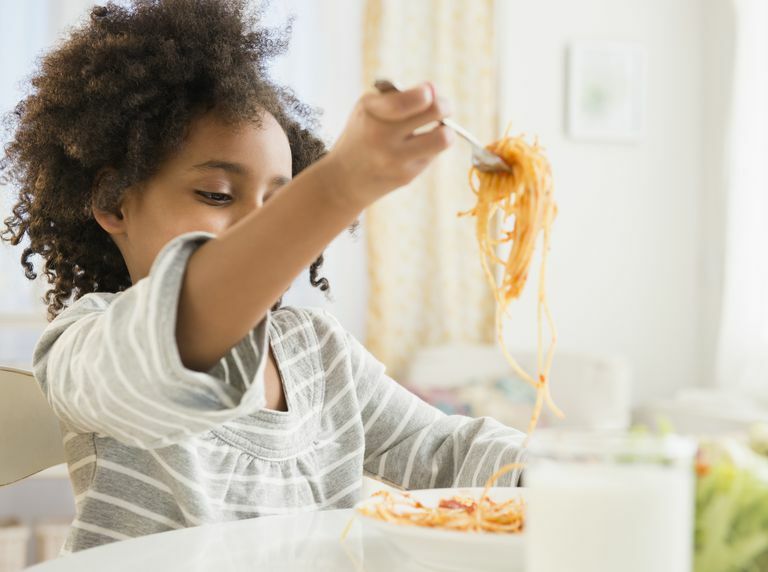 A child who refuses to eat certain textures or types of foods may have some underlying sensory issues or motor skill deficits. Talk to your child’s pediatrician if you have concerns about your child’s eating habits. Some kids have difficulty recognizing when they’re physically hungry. They may confuse boredom, anxiety, or even excitement for hunger. They may also confuse their body’s signals of exhaustion or thirst for hunger. It’s important to teach children to use food to fuel their bodies and to stop eating when they’re full. Just because a child asks for another snack or a second helping doesn’t mean he needs it. Instead, set limits with food and help your child learn how to recognize when his body needs fuel and when it doesn’t. A child who focuses too much on food may eat too much. Children who perseverate on eating may constantly ask what’s being served at the next meal. At other times, children may focus too much on food out of a fear of becoming overweight. They may fear to consume too many calories and may avoid eating certain groups of food. Help your child develop a realistic and healthy attitude toward food. Role model healthy eating habits and place an emphasis on health, not on caloric intake. Obesity is a problem in many families. It can have devastating health consequences for children. It can also take a toll on their social lives. If your child is overweight, take action to help him drop down to a healthy weight range. Encourage your child to exercise, eat in moderation, and make healthy food choices.